Happy Wednesday! We are at midweek, that means the weekend is almost here. Catch up on your weekly errands and chores today so you have more down time this weekend. Here are some tips to accomplish today or tomorrow, so on Friday you already have things crossed off you to-do list! HHH#1: Pull out all of your Halloween / Thanksgiving / Fall decorations. Do a once over and purge any decorations that can go. Throw out or start a pile to donate. Summer and/or back to school decorations? Put them away in a labeled bin or box. HHH#2: Organize your paying bills tracker. Fill it out for the next two months so you know what you are spending and what you have left for holiday gifts. Start outlining your gift list now! Shop on clearances and sales. More tips on holiday shopping? Read these Helpful Holiday Shopping Hints. HHH#3: Take out your fall blankets and sheets for your bed and wash them – it’s starting to get chilly at night and in the mornings- won’t it be nice this weekend to have clean, fresh blankets to snuggle up with? And you can stay in bed for some extra time since you got this jump start on your to-do list! 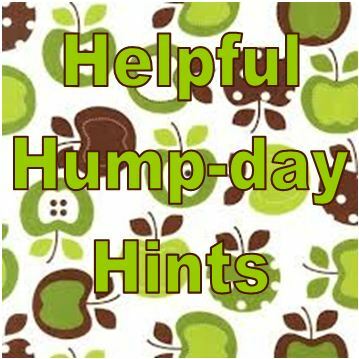 Did you accomplish any helpful hump-day hints this week? Leave a comment and let me know! Happy Hump-Day! Thanks for reading!